*And to further limit this, I’m only going to consider “narrative” animated programming. And by narrative I mean cartoon shows that are a full half-hour program with only one story and not a collection of animated shorts, such as the classic Warner Bros. and Disney cartoons. It also helps if the series as a whole has a larger structure, but that is not a requirement. So now with those disclaimers out of the way, let’s chat. I already mentioned how after seeing The Last Airbender over the Fourth of July weekend I decided to seek out the original cartoon series and was wowed by the score. That got me thinking about animated shows as a whole and their scores. I have written in other places on this blog about animated shows and their music – such as Shirley Walker’s score for Batman: The Animated Series or the music for Cowboy Bebop – but I figured now would be the time for a formal declaration of what I think are excellent examples of scoring for animated television shows. Before we get to the list, I will provide one final caveat: I can only talk about what I’ve seen and know, obviously. This has been implied in all my earlier lists, but given my even more limited knowledge of a lot of cartoons, especially ones made post-2000, I figured it would be prudent to restate this fact. As is my “new” custom here, I’ll present these in chronological order. Batman: The Animated Series (1992-1995) – Shirley Walker, et al: For me, this is the cartoon series that really changed how I view the medium, it also helped that this was realesed just as I was entering adolescence. The series was dark, moody, and didn’t really shy away from dealing with topics seriously. It didn’t “talk down” to kids which is why those of my generation who grew up with the show still hold it in high regard and enjoy it to this day. And just as the series itself doesn’t fall into children’s cartoon cliches, so does the score. Building on the tone of Danny Elfman’s Batman film score (he also did the show’s theme), Shirley Walker and a team of composers wrote orchestral music that set the standard for how I judge music for animated shows. La-La Land records released a two-disc set with music from a collection of episodes back in 2008, but it quickly sold out due to fans like myself snatching up all of the 2,500 copies. Just shows that even after almost twenty years, this show continues to have an impact. 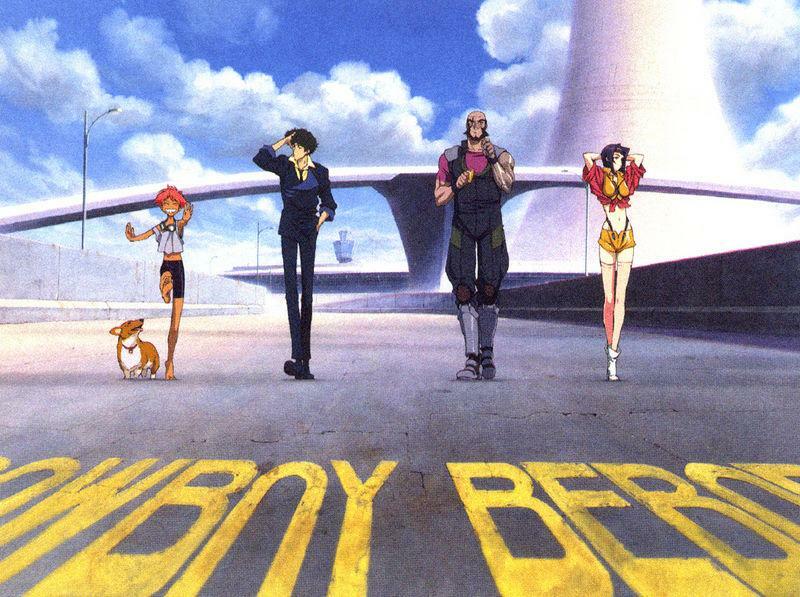 Cowboy Bebop (1998-99) – Yoko Kanno and the Seatbelts: The first of two Japanese anime shows on this list, Cowboy Bebop has a stunning score that pulls from just about every musical style there is, though, as the title indicates, it focuses mostly on jazz traditions. I didn’t discover this series until the penultimate year of my collegiate education (sometime around late 2002), but the first episode I saw, entitled “The Ballad of Fallen Angels,” was a great entrance into the show. Featuring an opera scene that takes its cues from the opera sequence in The Godfather, Part III, and a pop-song sequence, along with more conventional non-diegetic scoring, the episode encapsulated just how closely music is tied to the overall aesthetic of the show. And what is so great about Bebop and the other anime on the the list (see below) is that they are both 26-episode long shows that were planned as such. This means two things: first, relatively cheap complete DVD sets (around $50 each, and usually available at your local Best Buy), and second, there is a continual story arc from the first episode to the last which makes for a great viewing experience. Samurai Champloo (2004-05) – DJ Tsutchie, Force of Nature, et al: This is the other anime show on the list, and whereas Bebop is a jazz influenced show, Samurai Champloo, despite its 19th Century setting, features a soundtrack of hip-hop, rap, and R&B. And while you might think this anacronism might clash or be distracting, it works so well because the characters themselves are anachronistic in some ways. Their attitudes are more contemporary, one character, Jin, sports John Lennon-esque glasses, which, while not uncommon in the era, certainly separates him out. While personally I don’t like this score nearly as much as Bebop – if it’s for pure listening pleasure I will go for Bebop before Champloo – I find that I think it works quite well in context and the sheer variety of tracks and styles set it apart from the everyday fare of animated programming. For comparison, the only other anime series I really enjoy, The Big-O (giant robot anime and such but with a noir-ish twist), while having some nice score pieces that help set the noir tone of much of the series, they are too few and are overused. What, for me, helps set a television score apart is how often they will “go to the well” and reuse music. If a composer is given enough freedom and time and can write enough new music for each episode and lessen the use of preexisting tracks, it helps raises the overall quality in my opinion. Star Wars: The Clone Wars (2008-Present) – Kevin Kiner: The score for the television Clone Wars series (not to be confused with the earlier series) follows much in the style of the CGI film, in fact the film itself was really just a multi-part episode re-edited for the theatre. Kiner’s score for both the film and series follows in the tradition of Avatar in that he uses a lot of instruments not before heard in an animated show…well at least until Avatar itself (though some of the Asian instruments, such as duduks and taiko drums, had been used perviously in Bear McCreary’s Battlestar Galactica score). According to an interview for the film’s special features he strives to create a new sound for each world featured in the show, and he succeeds in large part. I’m slightly confused that on IMDB Kiner is only credited for 17 episodes on the series, but no other composers are listed under the series credits. I’m guessing that someone has been slacking off in the cataloguing department because each episode features mostly new music and new themes as characters are introduced to the series. In a three-part story arc ending season 2, the young Boba Fett, a well-known character from the original film trilogy, is introduced and has teamed up with a group of Bounty Hunters (many seen at other times in season 2) in order to seek revenge on the jedi who killed his father. For this, Boba is accompanied by a theme that is strongly reminiscent of Harmonica’s theme from Once Upon a Time in the West, which is fitting since Harmonica was seeking revenge for the death of his brother in that classic film. Oh, and the score also features the big orchestral sounds that one would expect of a Star Wars related score…so it’s got that going for it, which is nice. Well love it or hate it, those are my five. Next week, in recognition of the upcoming release of Christopher Nolan’s Inception (music by Hans Zimmer), FSFT5 will take on Sci-Fi scores of the last five years. Will Zimmer’s efforts make the list? I don’t know since the score isn’t released until 7/13. Regardless, I’ll hopefully have a full review up sometime over the weekend of the 16th. And, finally, Bear McCreary has at long last gotten some love from the Emmy committee! His theme from Human Target has been nominated in the category of “Outstanding Main Title Theme Music.” Congratulations, Bear!